For Wallace, it began with his grandmother who began the work in the late 1940’s, laboring long hours and meticulously at her typewriter. She compiled genealogy for her seven grandchildren as Christmas presents in the 1960’s. Wallace and now his daughter, Mary have taken it over. But, while Wallace was alive, worked with James for this wonderful work of history above. It’s fitting that yesterday was the anniversary of his death. He was also known as “Mr. Sawdust” a master furniture maker and founder of the “Mr. Sawdust School of Professional Woodworking”. “At least forty families of Protestant Kunkels immigrated to America from Germany between 1728 and 1770. Some of the Catholic families of Kunkels immigrated to the United States after the War of 1812. Many of the early Kunkel families settled in Pennsylvania. Today Kunkels live in Pennsylvania, Maryland, Ohio, Wisconsin, Illinois, Indiana, Minnesota, and throughout the United States. The surname is spelled Kunkel, Kunkle, Gunkel, Gunkle, Konkel, Konkle, and other variant spellings.” -J.E. Kunkle & W.M. Kunkel, 1995 (415 pages of history). Please do read the link above, it starts with our first notable Kunkel, Baron Johann Kunckel von Löwenstern, a German chemist who, about 1678, duplicated Hennig Brand’s isolation of phosphorus. A court chemist and apothecary, he later directed the laboratory and glassworks at Brandenburg. ~Britannica.com (Notice that says “glassworks”?? C — hole where the tapered blowpipe is attached . . . so that the air is directed onto the flame acute & concentrated, producing a flame that will melt glass. Goldsmiths have a similar system for soldering metal. Our Kunkle’s start with my grandmother, Hilda Leonore Kunkle. Unfortunately, I do not have any oral history to share as I did not know my Dad’s family. Most of what I know was learned later in life through my brother and sisters and through letters from my Aunt Elva, Hilda’s daughter. The other is from document facts and history from others. Hilda married Glen Henry Logan in Indiana County, Pennsylvania in 1921. Her father was Charles J. Kunkel (you’ll notice how the name is interchangeable with the -el and -le) who married Carrie Morrison in 1892. Charles lived most of his life in Westmoreland, Pennsylvania until his wife died in 1937. He then moved to Michigan to live with his daughter, Hilda, and her family until his death in 1948 at the age of 82. Charles’ father was Michael Kunkle. He also grew up in Westmoreland, Pennsylvania. Michael married his neighbor, Esther “Hettie” Hawk, in 1860. They were Lutheran and Michael was a carpenter. Later the census’ show he was a farmer the remainder of this life. Michael died in Westmoreland at the age of 80 in 1918. Michael’s father was, interestingly enough, Daniel. They lived on what was called Michaelsburg Plantation, that was about 336 Acres, a plantation owned by another family member. His family was one of the First families in Hempfield Township. Daniel married Mary Elizabeth Kepple and they had Michael. They moved from Westmoreland to Indiana, Pennsylvania where he worked on the railroads as a lock tender. Elizabeth died about 10 years later and he married Catherine Iseman in 1844 and she died of cancer in 1850. Daniel then married Sarah, last name unknown, in 1852. Daniel’s death is still unknown, but I know he lived until at least 1870 where he shows up in the census at aged 66 and still working for the railroad. This is where things get interesting and why I have put off really concentrating on the Kunkel family. The names start using Johann as the first name (For boys, the first name was almost always Johann or Hans while, for girls, it was usually Anna or Maria.) I’ve had to redo my Kunkle line twice because I’ve followed the wrong limb. But, thanks to another researcher, Vernon Cook, along with James Kunkle, I am back on track. Daniel’s father is Johann Jacob Kunkel (Gunckel), Jr. It is this generation that the Kunkel and Gunckel is interchangeable. He married Elizabeth Schaeffer in 1789 and had 10 children. My records show that he was a farmer and his death was caused by “gravel”. After researching old terms of death, it seems that “gravel” was a word for the modern equivalent of kidney stones. He is buried in Brush Creek Evangelical Lutheran Church Cemetery. There is also extensive research done on the Gunckel family by Tom Gunckel. You can view his research at http://www.gunckel.com/gunckela.pdf. Joh. Jacob’s father is Johann Jacob Gunkel, Sr. His father is our immigrant ancestor of this family. He was born in Breitenburg, Germany in 1746 and they immigrated in 1749 when Jacob was only 3 years old. Tom writes, One of the first known settlers in Pine Grove area after the French and Indian War, 1689-1763, Great Britain Battles France over unsettled territories in N. America, was Jacob Gunkel. He located on the site of the Eagle Hotel in 1771. Here he laid claim to a tract of two hundred acres of land which he subsequently purchased from the John and Richard Penn, proprietors of the Colony of Pennsylvania which included the site of the present borough of Pine Grove. The convergence of several roads on Gunkel’s plantation made it an excellent location for a tavern and soon after he purchased the land he erected a log building, Gunkel’s Tavern, which he kept till 1810 and then he removed to a farm about a mile south from the borough were he died in 1813. His property was located next to the property of his daughter Eva and husband Johannes Loffler. Another source states, he “kept a house of entertainment, and in 1795 opened a store which he kept until 1810. (Source: History of Schuylkill Co, PA, by W. W. Munsell & Co, – 1881). On May 21, 1810, Jacob Gunckel of Pinegrove Township, Berks Co, PA, yeoman, and Susannah his wife sell to John Gunckel, yeoman, for 255 pounds, land containing 235 acres, part of the larger tract of land called “Gunckel’s Farm”. (Deed book 24, page 488). This Johann has been confused with Johann Michael Gunkel who was the same age. They were first cousins, both from Breitenborn, and used similar names for their children as well as going to the same church. By the way, Johann John also had a brother named Johann Jacob. Talk about confusing! John is also our Revolutionary War ancestor. His SAR Patriot number is P-171729. Although it is a fact that he served in the Revolutionary War, it is unproven by me as to where he served. The above was written on his Find A Grave description. John died in 1795 at the age of 73. Records extracted from the Parish Church of Budingen, Germany, up to 1735, by “Heinrich P. Göbel” in 1994. More research is needed on him. Lorentz married Anna Catharina Gundlach in 1709. It is uncertain who the “young child” is that immigrated with them. Lorentz’s father was Hans Gunkel. Hans was born in Neuhütten, Spessart, Germany in 1636 and known as a Catholic man. He married Margareth N. and worked in a “glass house”. They moved to Breitenborn where upon the request of an invitation of Heinrich Gundlach, who was the headmaster of the Breitenborn Works. 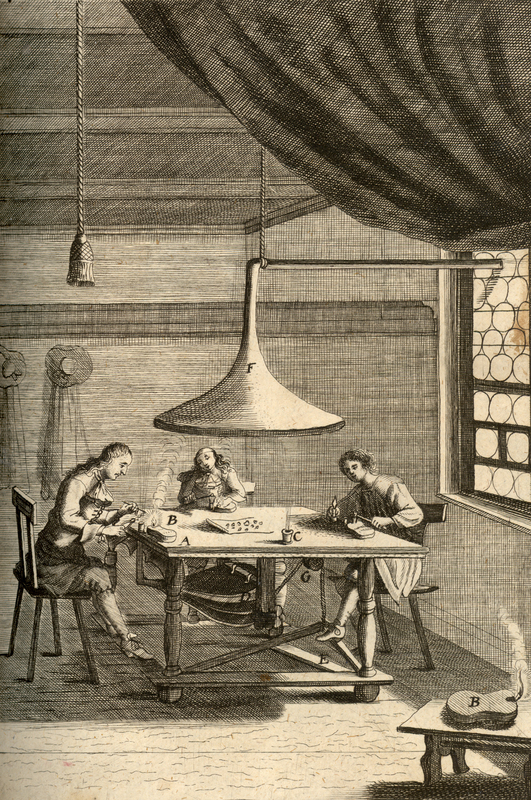 He recruited glass makers from all over the country in the 1670’s and 1680’s. Hans Kunkel, apparently was a good glassblower, as most Kunkel’s were all over Europe by this time, and Gundlach tried to get the best ones to come to Breitenborn. It is amazing that he was still going strong in the 1680’s. For example, he produced 42,300 drinking glasses of different types during the period from 04 January 1684 to 26 November 1685 at an age near 50 years. His earnings were 91 fl. 16 alb (the equivalent of the dollar in those days). 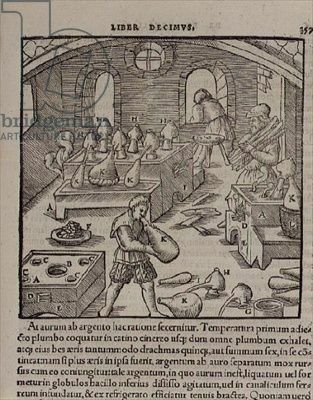 Besides blowing glass, he was also occasionally attending the furnace which was an important task, to maintain the proper temperatures during the melting process. Despite all the hard work, Hans Kunkel lived to be nearly 100 years of age. There is a lot more similar data available, basically showing production figures, earnings, how they were paid (normally 50% cash, and the other in natural things, like grain, flour, etc. and the beverages, like beer and brandy were also brewing there. Hans’ father was Johann Michael, born in Glasshouse, Germany about 1600. He married Anna Katharine Naumann. He died in 1676. Not much else is known about him. The Kunkels were already living in Neuhutten before the Thirty Years War. It seems Neuhutten and that part of Germany were already in the Lutheran camp. The Kunkels all seemed to be born, married and died in “The Glasshouse” in Neuhutten. Joh. Michael’s father was Johannes Jurg born about 1565. He married Elisabeth Christina Houser. The Kunkel family, up to today, are still primarily concentrated in the area of the Spessart Mountain range, a largely wooded area in the heart of Germany. Existence of an early Glass house in the Spessart area was mentioned in a document dated 22 August 1349. The area was under the jurisdiction of the Archbishop of Mainz. The Union Letter (Bundesbrief) of 1537 lists two KUNKEL’s, namely Jurge (George) and Hentze Kunkel, and in a later revision dated 24 February 1559, again two KUNKEL’s – George and Friedrich Kunkel. It is evident that there are links, as the Glass making was only carried down in the same families. This earliest known generation has only one mentioning of this earliest known family that was put together from the Parish register records received from a researcher in Germany, and combined with the data on the I.G.I. Index at the LDS Library in Salt Lake City, Utah, and the earliest records on file at the LDS Library on this Germany family. Much research is still needed to fill out all the missing information, however I have been told that Genealogy Records beyond this point is next to impossible to find, due to all the Wars that took place in this country. The “Thirty Years War (1618-1648) destroyed many Church records throughout Germany. So many records have been destroyed, and to find a cemetery with headstones that can be read after 500 years have gone by would be impossible to find. All Kunkels do not accept the “dweller by deep water” definition of the name. Other research has yielded another possibility for its origin: It seems to derive from the Old High German name “KUHN”, meaning “wise”; (In this case, such a compliment makes it acceptable.) GUNKEL probably refers to living by deep water. KUNKEL in a German word means the part of a spinning wheel called the distaff. A staff on which fibers such as flax or wool are wound before being spun into thread. Joh. Jurg’s father was Hans. Hans was born about 1530 in Glasshouse, Germany. He married Anna Catharina Wolfgang in 1554. Hans Kunkel, of Neuhutten, was called “Schwarzkoph” in the Parish records. Meaning “Black Forest”. There are some who show a Claus Kunkle born 1490 as Hans’s father and a Conrad born 1460 as Claus’ father, but I do not have sources to back these up. 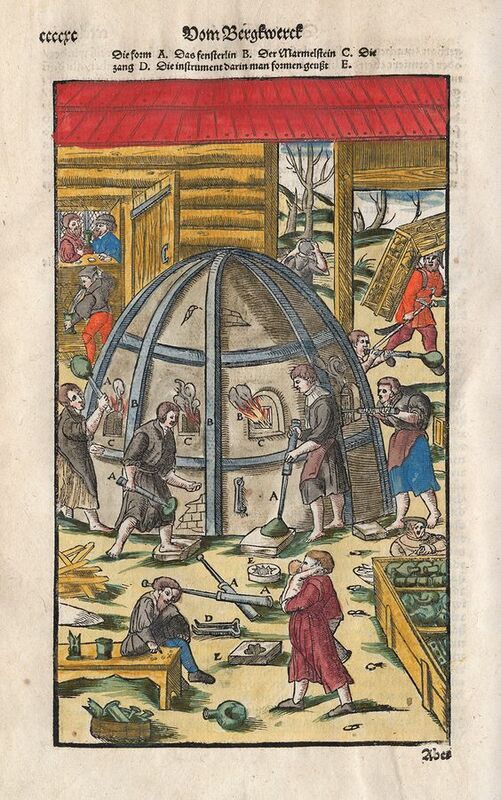 While I couldn’t find exact Kunkel glass other than the original Johann’s, I did find some drawings of what the glass blowers working areas were like in that century. There is still a lot to learn about certain individuals in this family and I hope to be able to add to the wonderful work done by James and Wallace. RIP, guys! You left a wonderful legacy for all of us.